Q. How do I search GSU Library's Research Databases? How do I search GALILEO? Georgia State University Library has many databases for your research, all accessible through the GSU Library homepage. These databases contain articles, books, videos, and other types of information sources. From the library homepage, you can use the GALILEO Discover basic search, select a specific database by name, or go to a list of databases by subject. 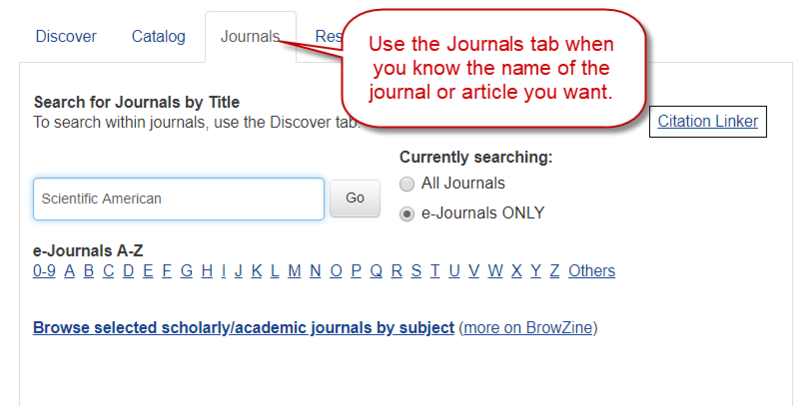 You can also go to the "Journals" tab to see if GSU Library has a specific journal title. The Discover Tool is the search box on the GALILEO homepage. When you search in Discover, you will get search results from many, but not all, of the databases in GALILEO as well as the library catalog. The Discover Tool also includes an Advanced Search with more search options. Discover is great for multi-disciplinary topics and often provides a fast way to get to information on a topic. However, many times you will get better results by searching individual databases, either through Browse by Subject or Databases by Name A-Z. If you know you want print books, DVDs, other other physical items, you can limit to "Library Catalog Only" or search in the GIL-Find library catalog on the Catalog tab. After completing your search, use the Limit To options on the left side of the search results page to narrow your results by date range and type of resource (e.g. e-book or article). Items with a "Find@GSU" button may not be readily available online. Click the button to find out where to locate the article or request an Interlibrary Loan. If you are not finding what you need, try altering your search terms or limiters. You might also try going to a database recommended for your subject. Remember you can ask a librarian for help -- That's why we're here! Multiple search boxes allow you to combine search terms in more complex searches. Drop-down boxes allow you to specify that your search terms are the title, author, or major subject of the item you're looking for. You can change the way the Discover tool searches. For example, you can choose to limit your search to the major descriptors of the articles instead of looking within the full text of articles in the "Boolean/Phrase" search mode. This type of search requires that you connect your search terms with Boolean Operators. Databases by Subject helps you identify the best databases (and sometimes recommended websites) for your subject. Use the menu (not the Discover search box) to locate the subject area that best fits your topic. For each subject, there is a list of recommended databases, along with a description of that database. Click on the database to access that database, then you can search in that database. Each database functions a little differently, so look for help information in the database (often a question mark icon), see if there's a tutorial on our Tutorials page, or Ask a Librarian for help. Databases by Name A-Z allows you to go to a specific database when you know the name of the database you want to use. Click on the first letter of the database, then scroll through the list to find the database. If you want to search for the database, go to the list of All databases and enter the name or subject of the database in the search box (not the Discover search box). A few databases have special requirements such as on-campus only or creating a separate account. Read the description to find any special requirements. Journals A-Z will help you find a particular periodical (journal, magazine, or newspaper) by title. If the full text of articles in that periodical are available in GALILEO, you will be provided a link to the database, along with the dates of the periodical included in the database. If no full text is available, you will still be provided with links to search in the library catalog for a print copy and an option to request articles from the journal through Interlibrary Loan. If you have a citation for a specific article, Journals A-Z also has a Citation Linker that allows you to enter more details about the article, such as the title, author(s), and journal, then will help you find that article. You can also use the GALILEO interface to use the Discover Tool, Browse by Subject, Databases A-Z, and Journals A-Z. To get to the GALILEO interface, go to the GALILEO link under "Search Collections" tab on the GSU Library homepage or go to http://www.galileo.usg.edu and log in with the GALILEO password. For more information, see our Research Databases video tutorials on YouTube and videos from the GALILEO Support Team.